Finding the cause of a blocked or broken pipe can be an exceedingly frustrating endeavor. Due to the remote nature involved with inspecting problems that occur in pipelines, it is simply not always feasible to conduct a human inspection. Fortunately there are solutions for these types of situations. Through the use of advanced pipeline technology, Rescue Rod is able to conduct remote inspections in nearly any type of pipe. 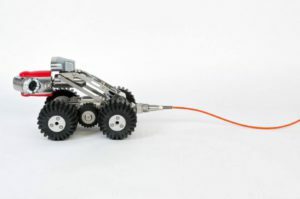 Rescue Rod has a range of CCTV pipe inspection equipment from tractorized high resolution cameras capable of accurately measuring the slope of the pipe in diameters from 100mmØ up to 1500mmØ to pushrod systems capable of inspecting from 80mmØ. We are able to inspect just about any non man man entry pipe, tank or vessel up to a distance of 500m. We now also offer explosion proof systems able to safely inspect in zone 1 explosive atmospheres. 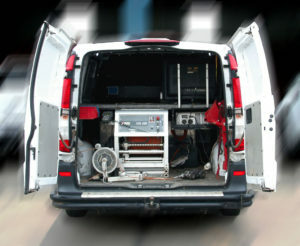 Rescue Rod uses Wincan for all CCTV reporting and data storage. The WinCan Software is a specialized application for the inspection and administration of wastewater network systems. WinCan offers different solutions starting with the collection of the inspection data to the analysis of this data and finally the integration into Geographic Information Systems (GIS). WinCan transforms raw data into the intelligence you need to make maintenance decisions. Its intuitive interface grants easy access to information while enforcing consistent data entry. Single-click video and still image capture, plus annotation and measurement tools, ensure every observation is robustly documented. Sophisticated search functionality lets you sort observations by location, type and severity, as well as perform statistical analysis. WinCan also makes sharing intelligence easy. It generates customizable reports that combine information, graphics and images for rapid comprehension. All video data and databases will be delivered on DVDs with a copy of Wincan Viewer software. Wincan Viewer is a simple to use application which allows the client to view video recordings, incidents and the pipe profile. The Viewer software is compatible with most computers and operating systems. Rescue Rod is equipped with the right equipment to create GIS (geographic information systems) which are designed to capture, store, manipulate, analyze, manage, and present all types of geographical data. Users of GIS mapping range from indigenous people, communities, research institutions, environmental scientists, health organizations, land use planners, businesses, and government agencies at all levels. Sonar Laser Profiling systems gives accurate data about the shape, capacity, ovality and deformation of pipelines. It supplies customers with in-depth reports regarding corrosion, debris levels and accurate pipe measurements enabling informed decisions on pipe integrity and rehabilitation programmes. Easy deployment with Light and portable system. Explore pipe diameters from 80mm x 1500mm. Up to 600m of transmission cable. Pan and tilt camera for enhanced inspections. 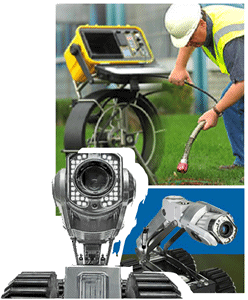 Impact and abrasion resistant cameras. Most effective method of identifying problems. Map all underground plumbing and assets. HD colour footage with precise crack measurements. 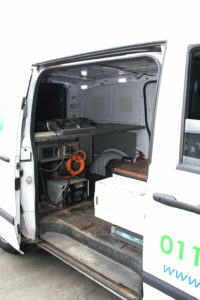 Learn more about the CCTV drain inspection equipment we use. Find more information on the technical specifications of our CCTV cameras.